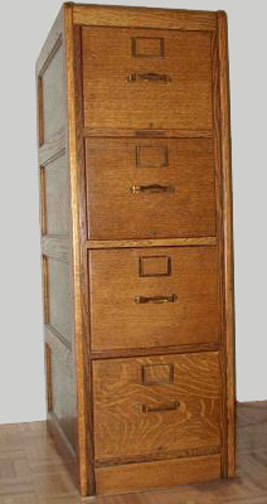 All the types of filing cabinets shown below were produced in wood. 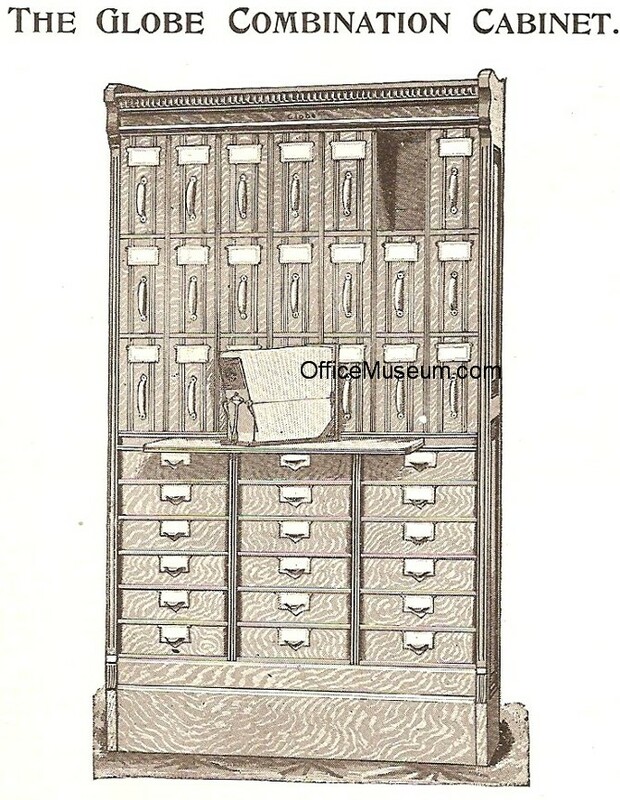 The earliest advertisement we have for metal file cabinets is from 1886. 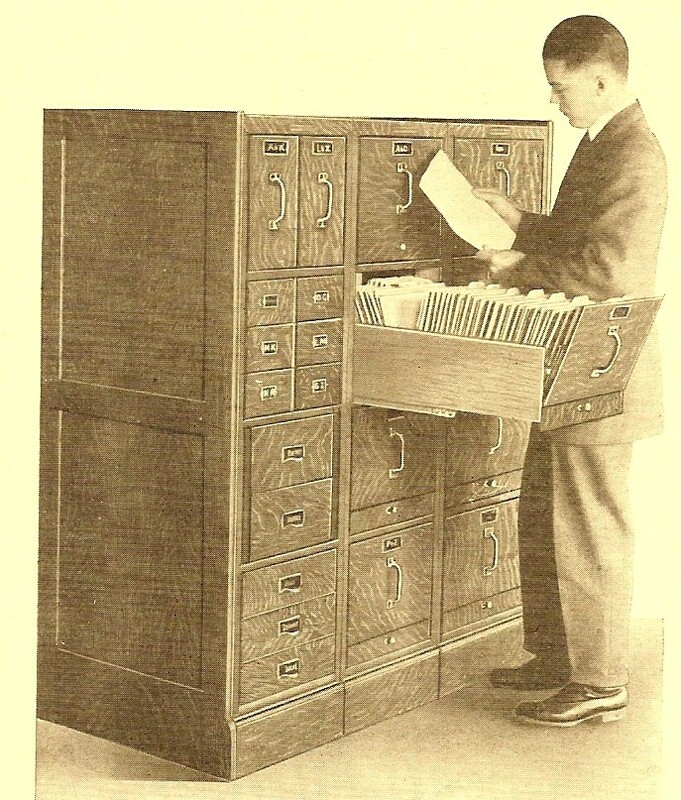 Steel filing cabinets were advertised as "absolute protection against loss of your records by fire" (1906). 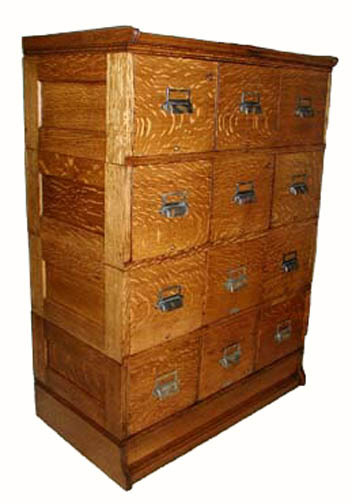 Over time the share of filing cabinets made of metal increased while the share made of wood decreased. 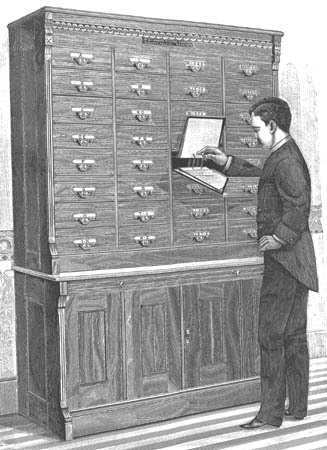 In the 1910s, some companies were supplying "cabinet safes," which were filing cabinets inside comparatively lightweight safes. 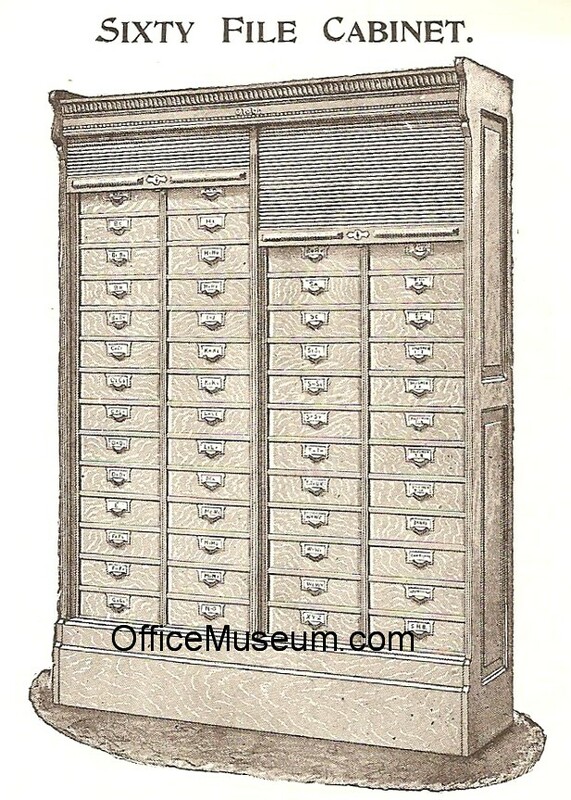 Go to the Early Office Museum page on Safes, and scroll to the bottom..
Letter Filing Cabinets have file drawers in which papers were stored horizontally, that is, lying flat. 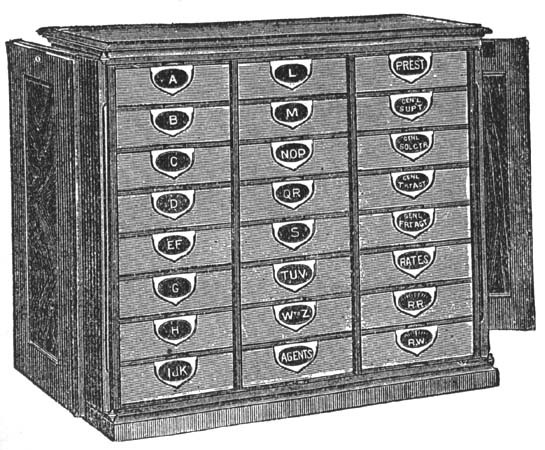 Drawers contained metal devices to hold papers in place as well as alphabetical dividers, e.g., the A drawer would have a divider for Aa to Ac followed by a divider for Ad to Ae, etc. 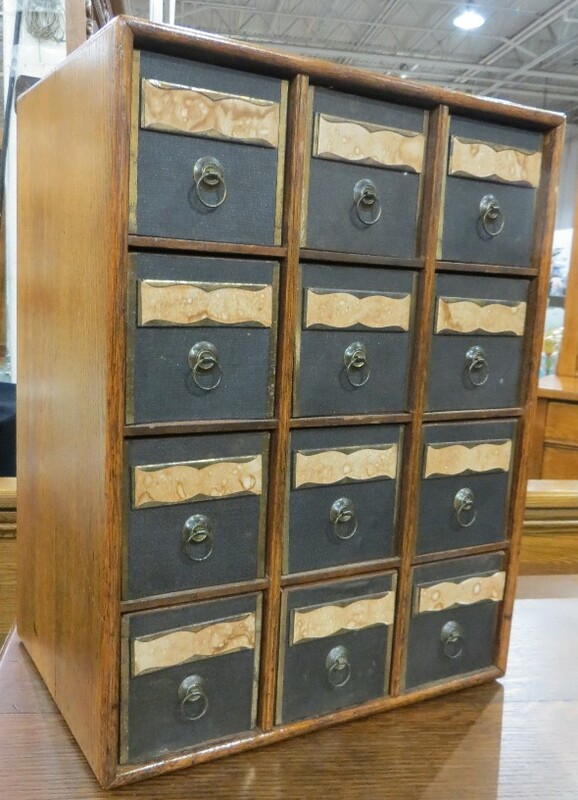 Cameron Amberg & Co. was established in 1868 and made its first Cabinet Letter Files in 1875, when they won an award from the American Institute, New York, NY. (Asher & Adams' Pictorial Album of American Industry 1876). In 1876, its Cabinet Letter Files were awarded a medal at the Centennial Exposition. 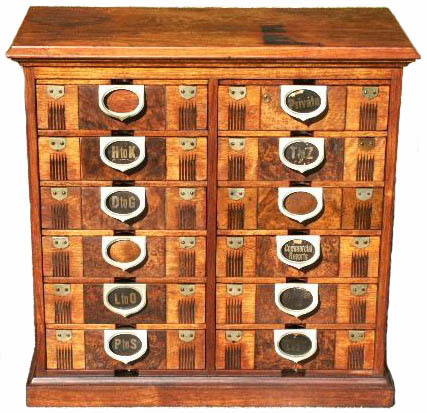 The metal devices in some of its drawers bear an 1878 patent date. 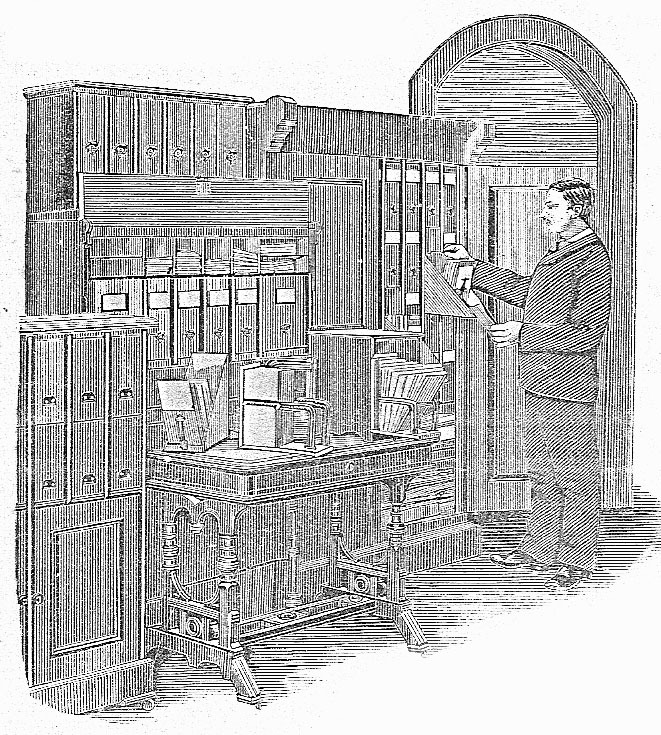 In 1881, 1,000 firms were using its cabinets. 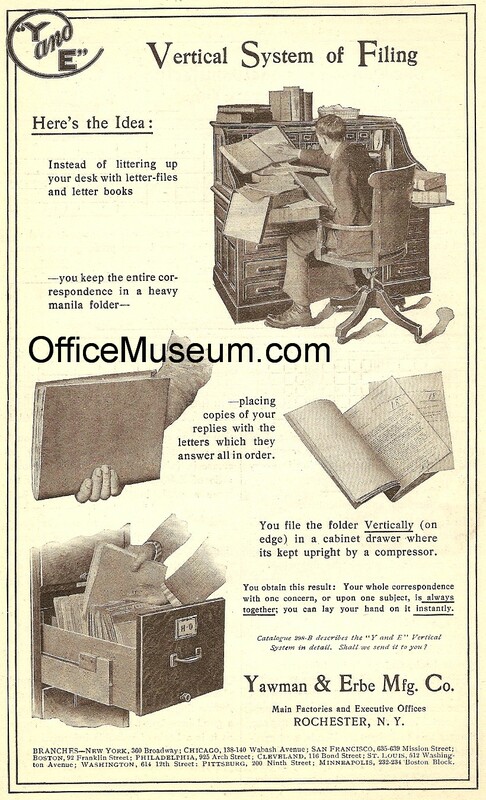 By 1893, the company name changed to Amberg Letter & File Co. (However, the Cameron, Amberg & Co. name appears to have been resurrected later, because the latter company published an office supplies catalog in 1930.) 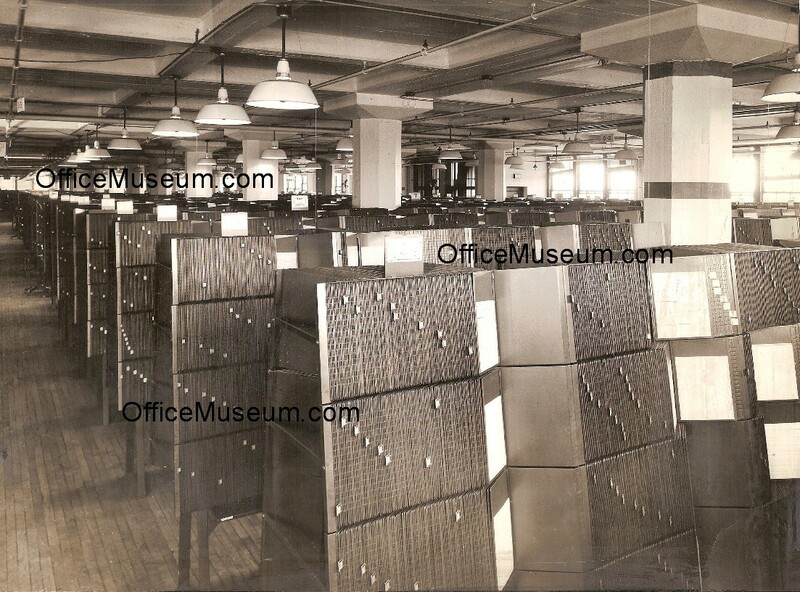 Shortly thereafter, its letter filing cabinets had patent dates from 1878 to 1896. 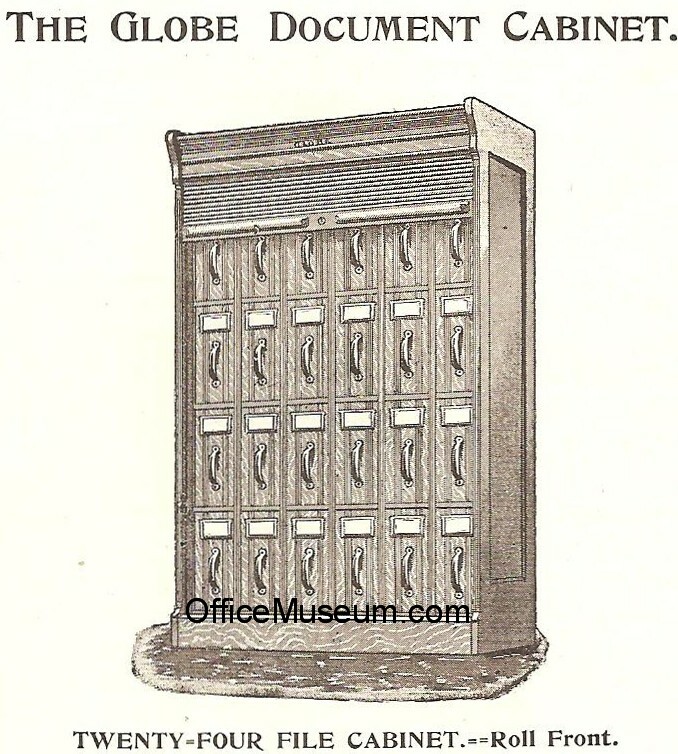 Globe Files Co.'s Letter Filing Cabinets received awards in 1882-83. Amberg's Letter File with tambour cover closed and open and inside of drawer. 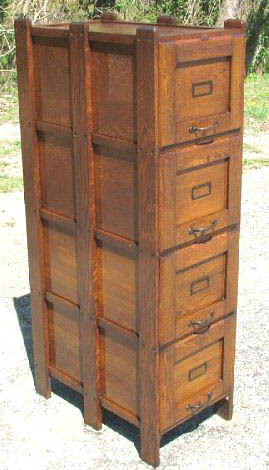 This cabinet was used for a number of years beginning in 1900. 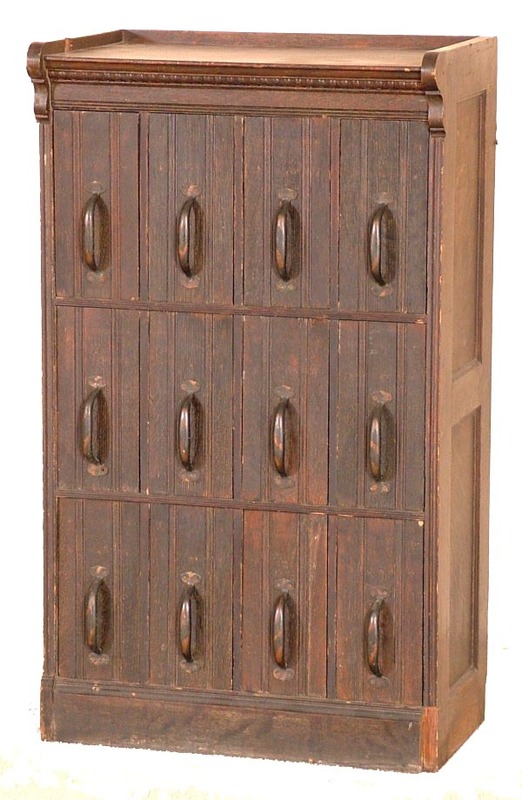 A virtually identical Wabash Cabinet was advertised by Rockwell & Rupel Co., Chicago, in 1899. (The Book-Keeper, Mar. 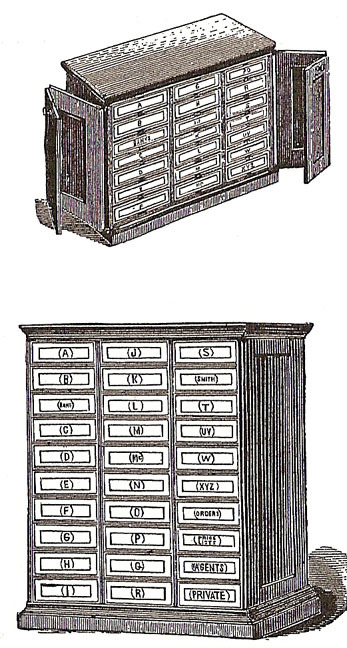 1899, p. 128b) The bottom image in the column farthest to the right shows the 1907 Globe-Wernicke version of this style of cabinet. 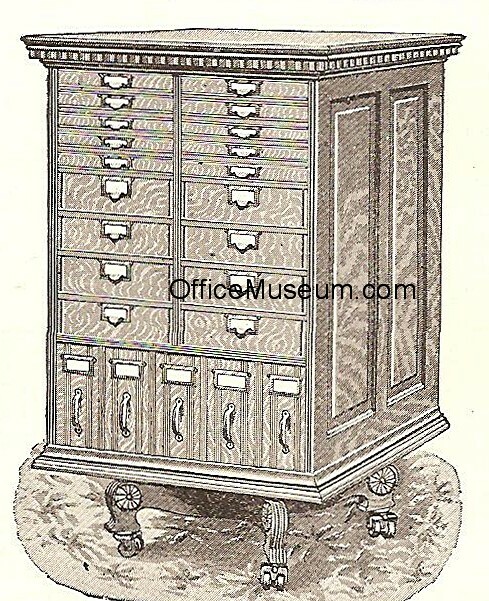 Globe Letter Filing Cabinet, Globe Files Co., Boston, MA, 1885 ad. 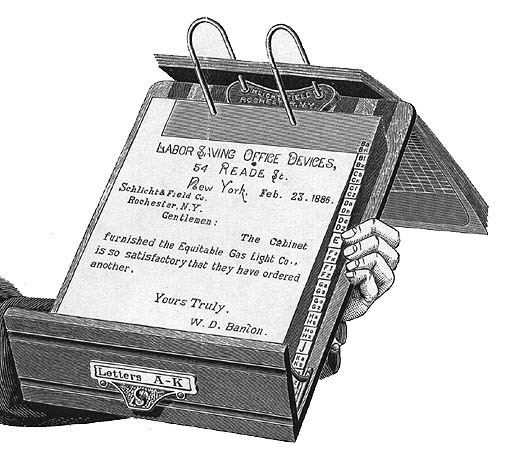 Globe advertised letter files of this type by 1883. Amberg Patent Cabinet Letter File. 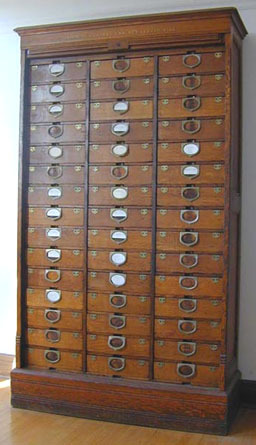 This particular cabinet was in use by 1898. 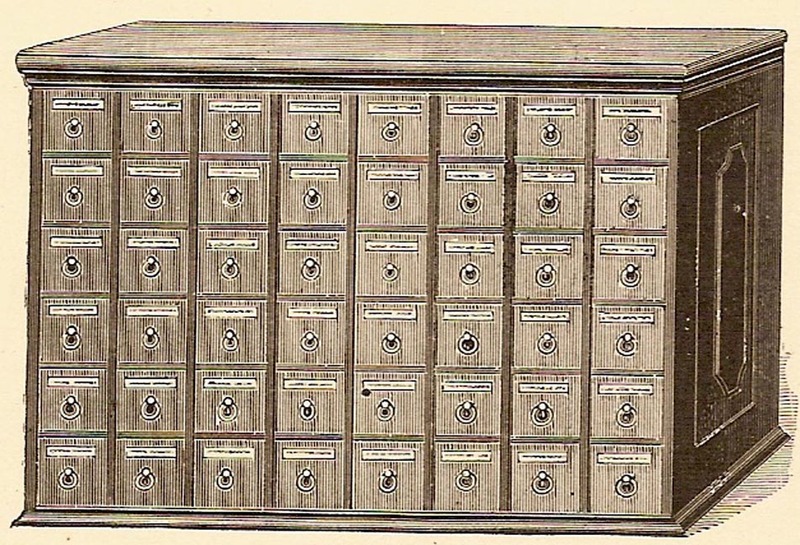 Sixty File Letter Cabinet, The Globe Co., Cincinnati, OH, 1894/95 catalog. The Globe File. 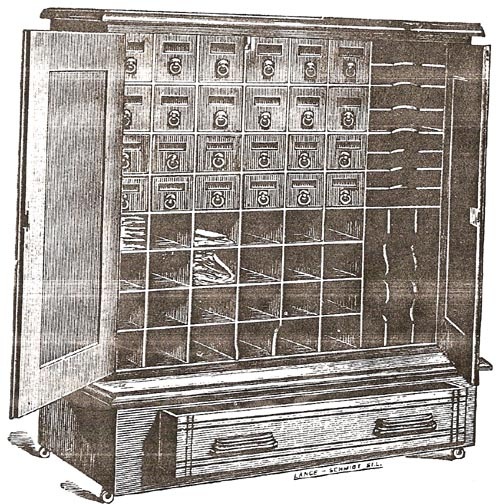 This cabinet was in use in 1889. Detail of Globe File immediately above. 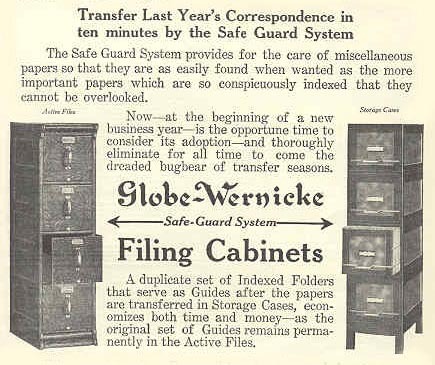 Fifteen File Letter Cabinet, Globe-Wernicke, Cincinnati, OH, 1907 ad. 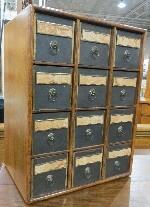 The predecessor Globe Co, Cincinnati, OH, advertised this type of file cabinet during 1895-1899. 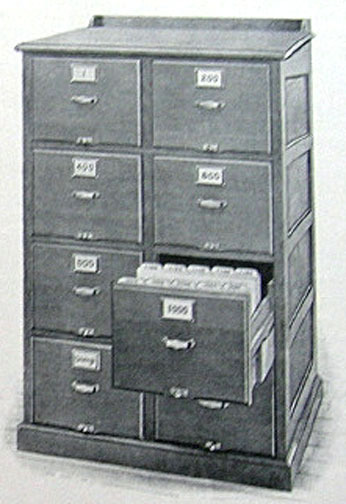 Document filing cabinets were advertised as late as 1936. Schlicht & Field Co., Rochester, NY, 1886 ad. 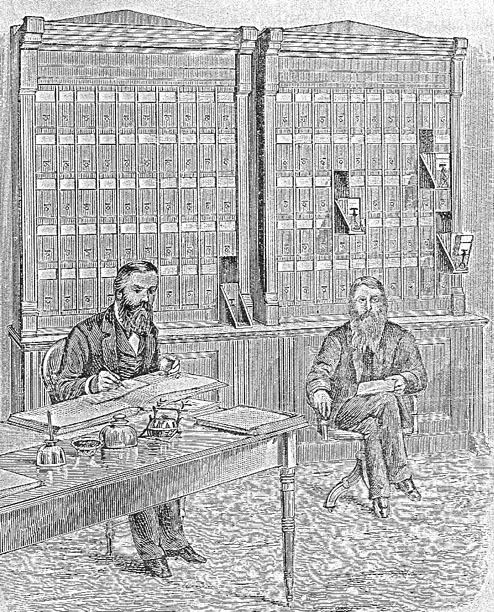 In 1887, Schlict & Field advertised both iron and wood document files. by Geo. D. Barnard, St. Louis, MO. Woodruff File. Display at National Museum of American History, Smithsonian Institution, Washington, DC. 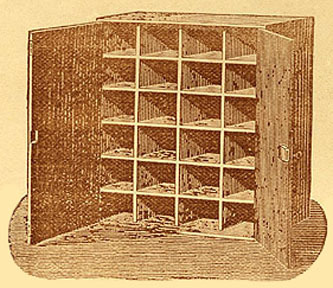 The individual document file boxes were patented by Woodruff in 1868. 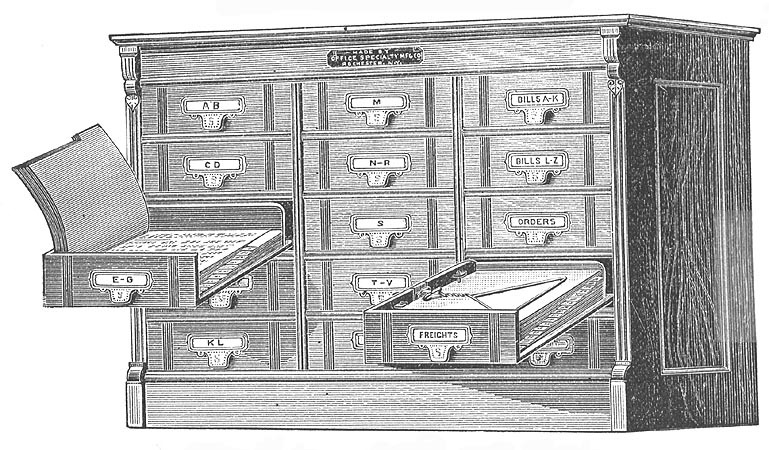 Both Woodruff file boxes and Woodruff file cabinets were advertised in 1887. 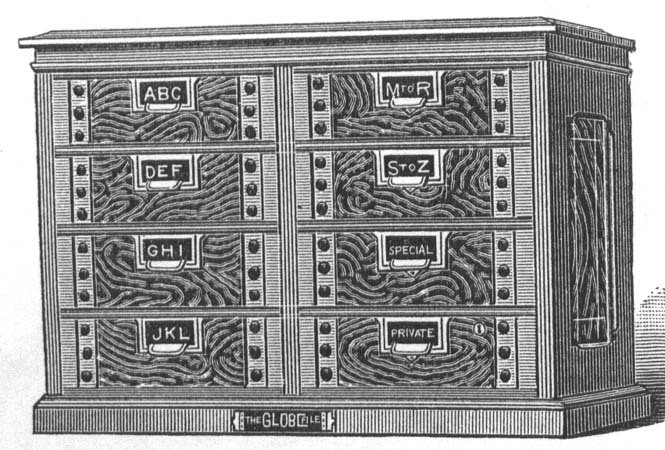 Twenty-Four File Globe Document Cabinet, The Globe Co., Cincinnati, OH, 1894/95 catalog. Globe Document Files, The Globe Co., Cincinnati, OH, 1894/95 catalog. 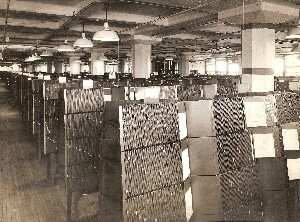 Combination filing cabinets were assembled to order by the manufacturer from modules. 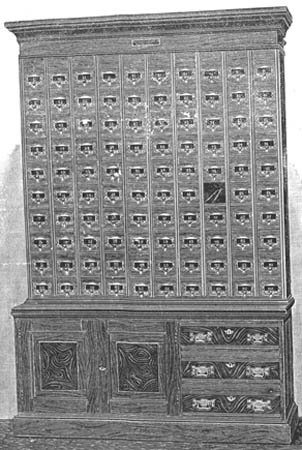 Revolving File Cabinet, The Globe Co., Cincinnati, OH, 1894/95 catalog. .
Globe Combination Cabinet, The Globe Co., Cincinnati, OH, 1894/95 catalog. Cabinets with open pigeon holes appear in a 1672 painting of a notary's office and a 1867 image of a Wells Fargo office. The document case at the bottom of the cell to the immediate right has 100 pigeon holes, each with a door. To open a door, one lifted its handle and slid the door upward. This pushed all doors above it upward as well. Earliest patent 1887. Other patents through 1894. The Monitor, G. L. Howe and O. M. Powers, The Secrets of Success in Business, 1883. Document Case, The M. Ohmer's Sons Co., Dayton, OH. 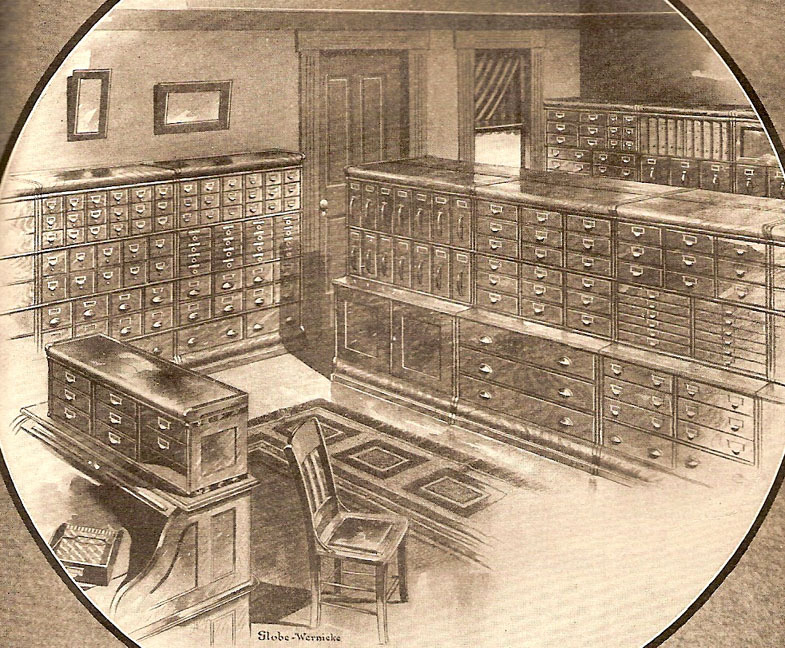 While this image is undated, the company exhibited filing cabinets at the 1893 Columbian Exposition in Chiaco. A.C.T. Case of 24 Pigeon-Holes, A.C. Thomson Co., Glasgow, Scotland, 1892 ad. 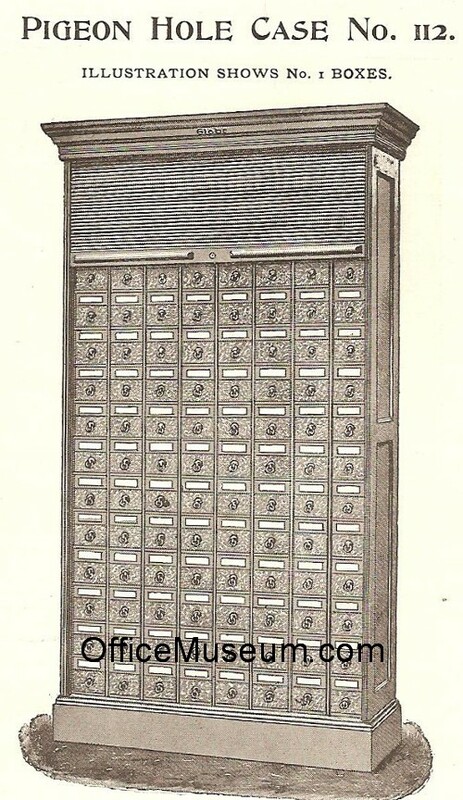 Pigeon Hole File Cabinet, The Globe Co., Cincinnati, OH, 1894/95 catalog. 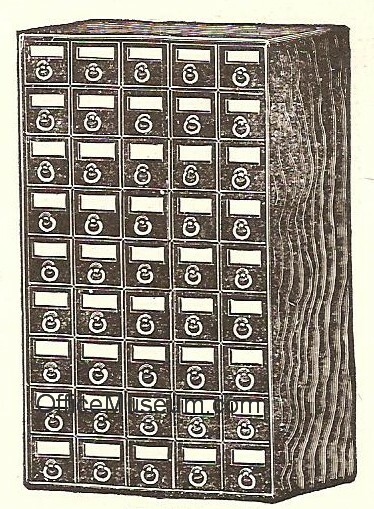 Pigeon Hole Case, The Globe Co., Cincinnati, OH, 1894/95 catalog. 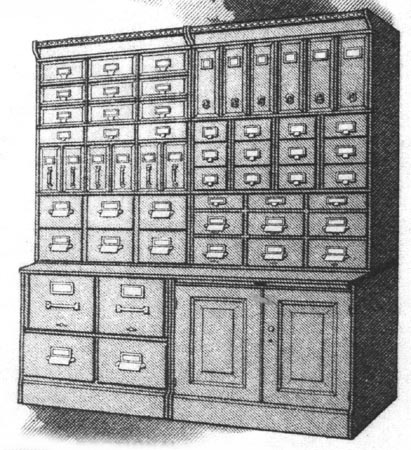 Tyler's Handy Office Cabinet, Tyler Office Fixture Co., Catalogue, St. Louis, 1895. 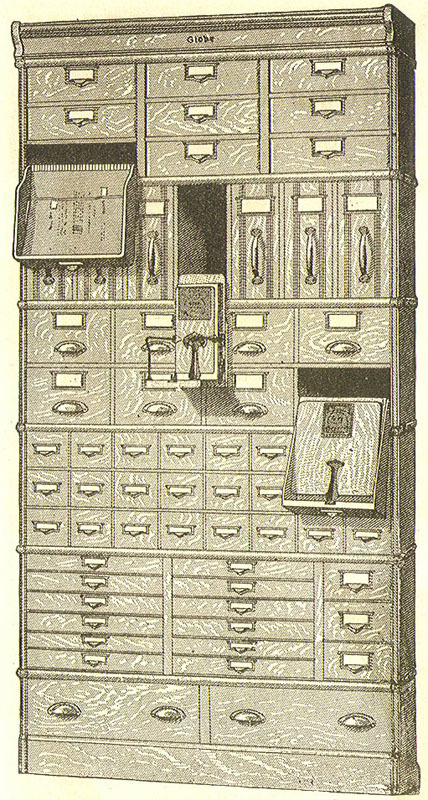 According to secondary sources: Perley Morse, Business Machines, 1932, states that the vertical file was invented in 1892 by Dr. Rosenau and exhibited in 1893 at the World's Fair. Allen Chaffee, How to File Business Papers and Records, 1938, p.4, repeats this. (See note at bottom of this web page.) Yates (pp. 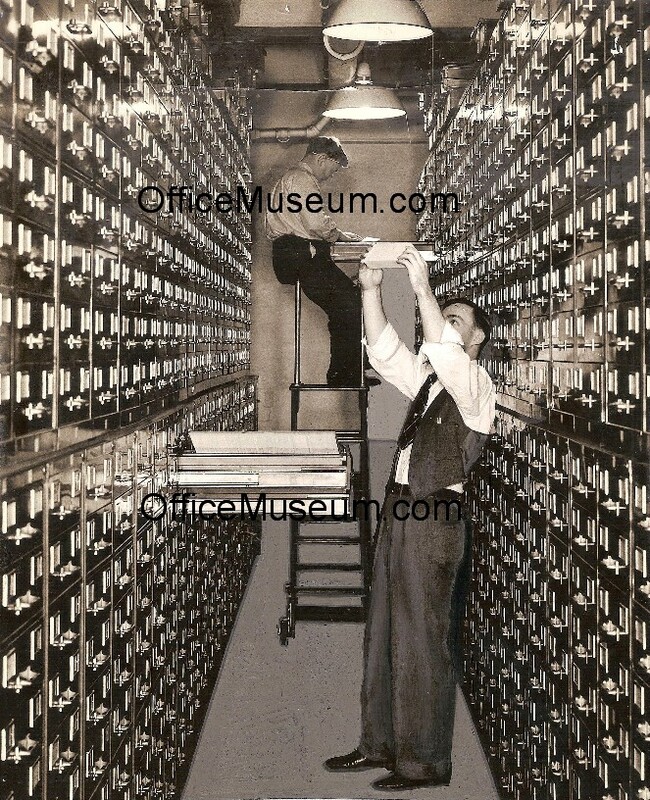 56-57) states that "Vertical filing of papers,...which evolved from the vertical file card files used by librarians, was presented to the business world in 1893....In 1892, the Library Bureau devised guides and folders for filing correspondence on edge and had file cases designed for them. They presented that system at the Chicago World's Fair of 1893, where it won a gold medal....However, the changeover [to vertical files] was not immediate and universal." Based on our research using primary sources: The Library Bureau, which was a well established supplier of furniture to libraries by 1893, had an exhibit at the 1893 Columbian Exposition in Chicago. 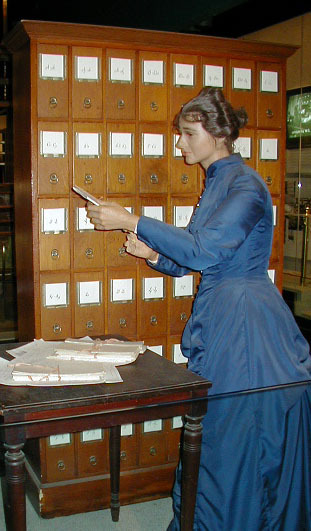 The catalog of the exposition states that the Library Bureau exhibited a "Card-case for records of charitable societies." (World's Columbian Exposition Official Catalog, Part VII, Department G, Chicago, 1893, p. 35) Other accounts indicate that the Library Bureau also exhibited other library furniture. 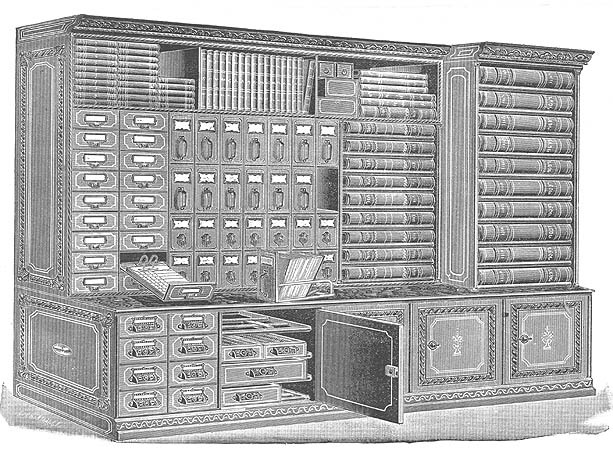 However, we have not found evidence in primary sources that the Library Bureau exhibited or won a prize for a vertical file in 1893. The Library Bureau published an annual illustrated catalog that was over 100 pages long during the 1890s to promote its furniture to prospective customers. No vertical file is advertised in the 1894, 1897, or 1899 catalogs, although these catalogs did advertise card catalogs. 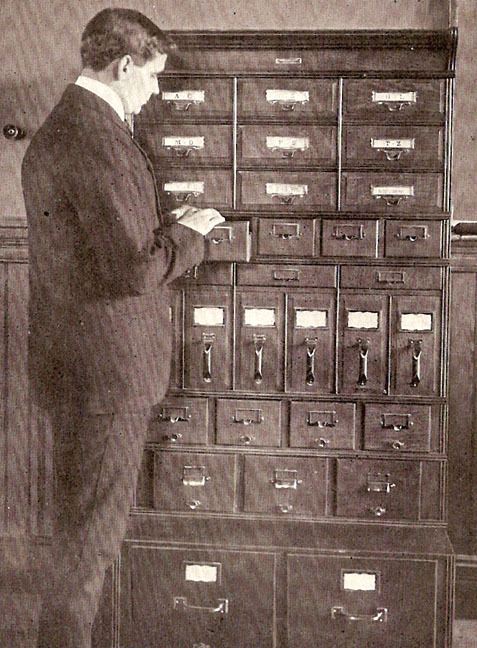 For the first time, the Library Bureau's 1900 catalog includes a Vertical Filing Cabinet, which was designed for storing letters. 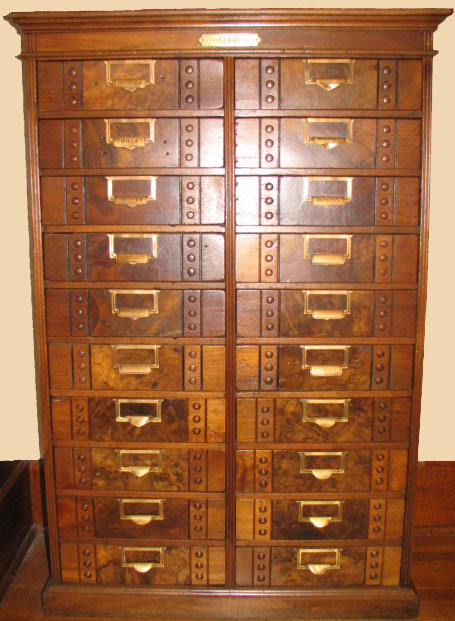 The catalog states: "This practical construction, [was] first used in card catalog cabinets." The catalog states that the company "next manufactured vertical filing cases for invoices and loose sheets, about 5" x 8" inside," and that "a still larger file is now made having inside dimensions 10" x 12" and 22" deep. 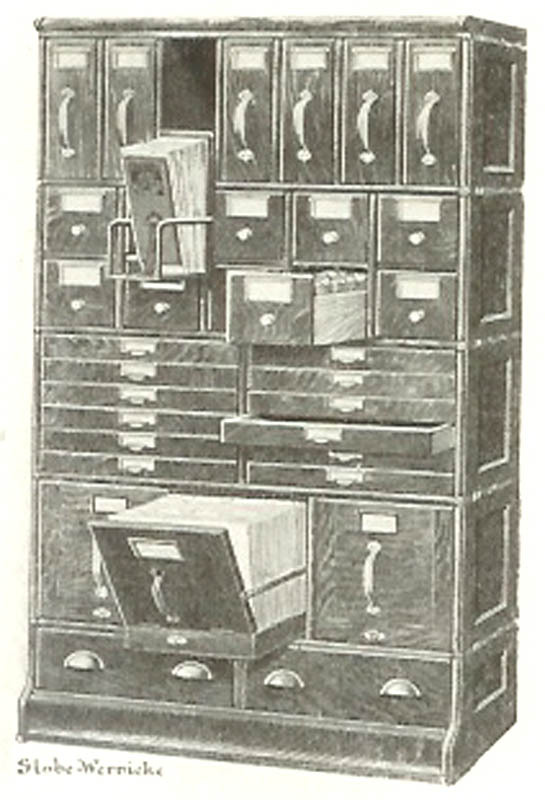 This file is designed for letters, pamphlets,....." (Library Bureau, Classified Illustrated Catalog of the Library Bureau, Boston, 1900, p. 112, emphasis added) These statements suggest that it was not until 1900 that the Library Bureau marketed vertical files large enough for an unfolded letter to be filed vertically. 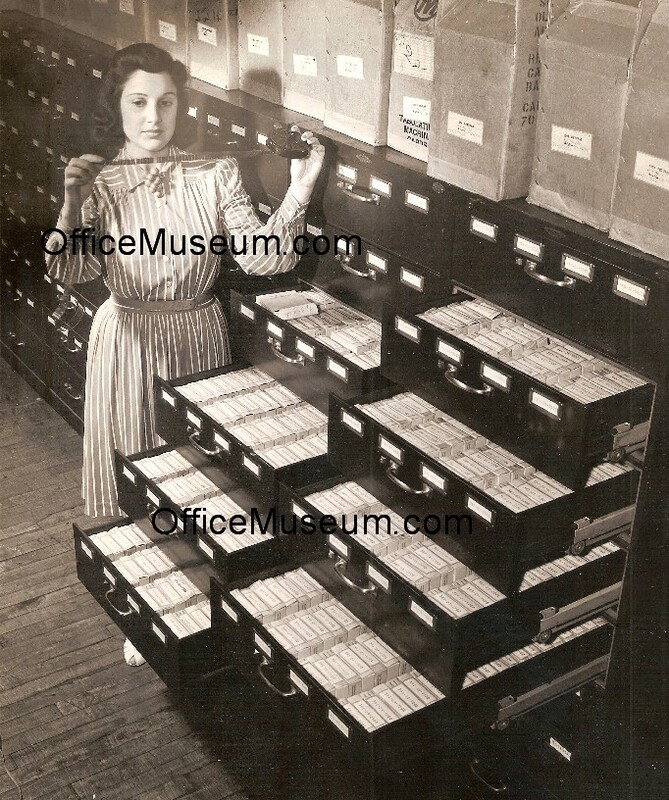 These vertical filing cabinets apparently used technology that was patented or licensed by the Library Bureau beginning in 1892, but that technology was probably developed for card catalogs. 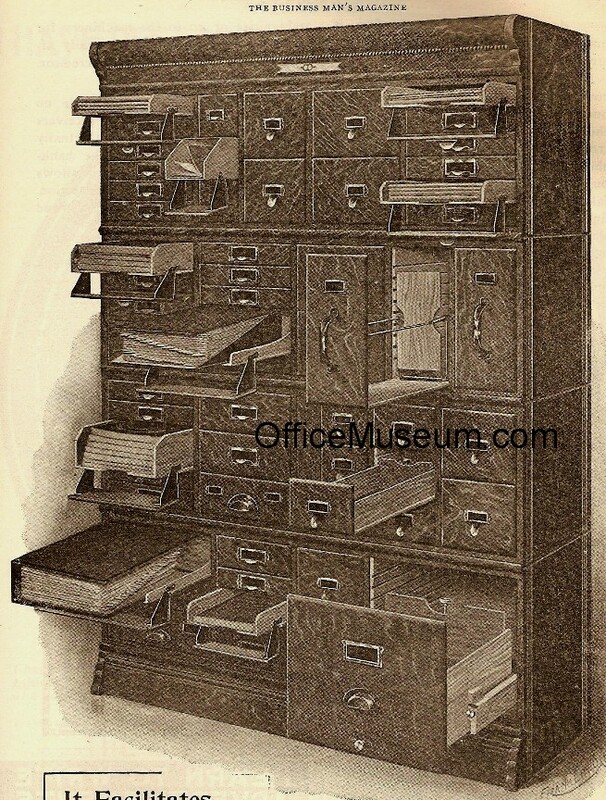 We reviewed many illustrated catalogs and ads from the 1890s showing filing cabinets made by various manufactures. 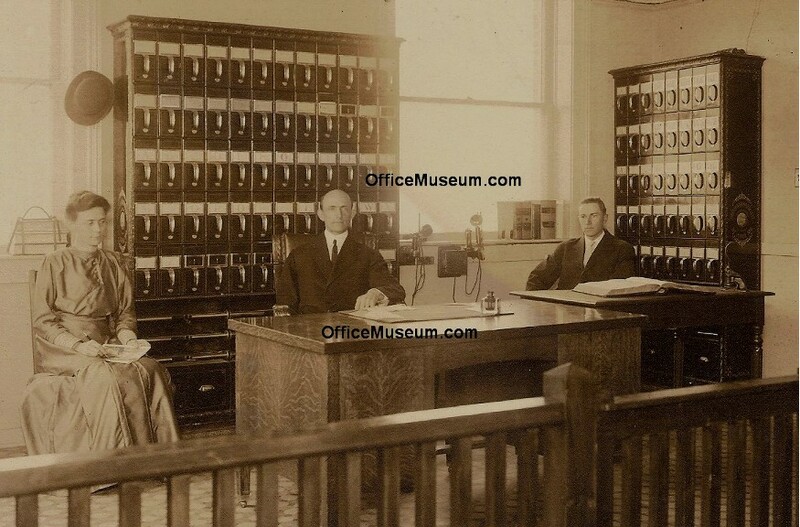 We also reviewed numerous photos of office interiors from the 1890s. None of these catalogs, ads, or photos showed or mentioned vertical filing cabinets. 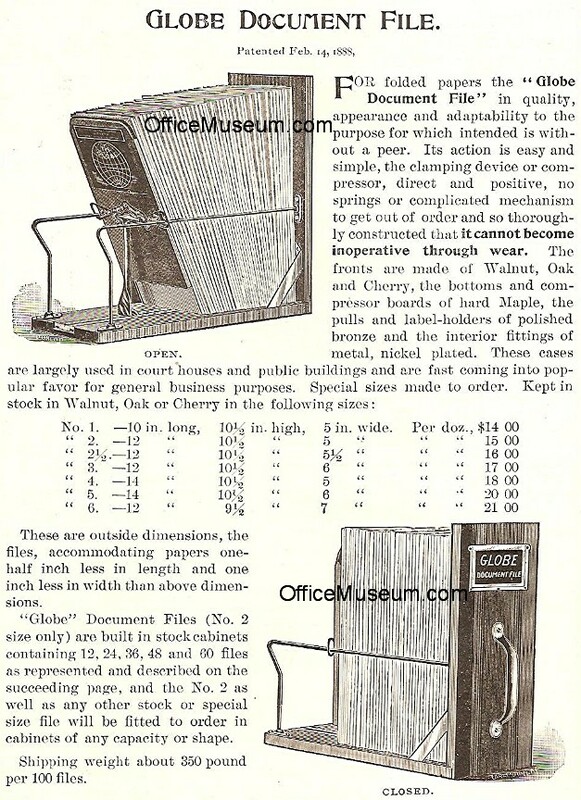 After extensive searching, the earliest evidence we have found of a vertical filing cabinet being marketed is the 1900 Library Bureau catalog cited in the preceding paragraph. 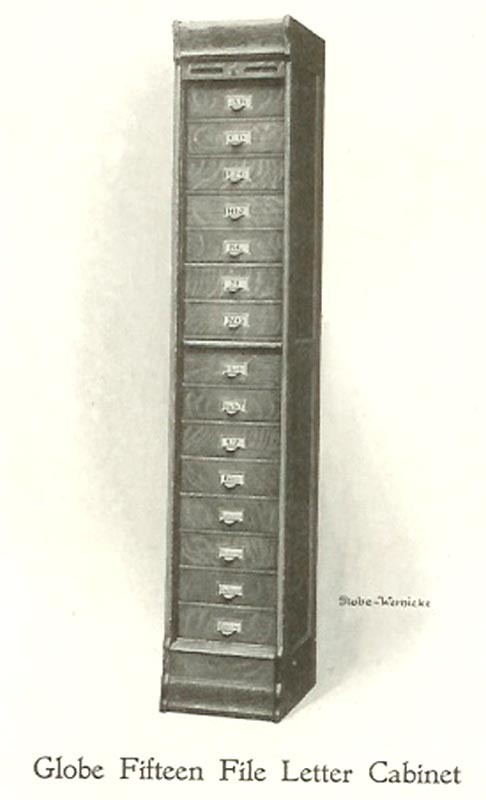 Other companies began to advertise vertical filing cabinets in 1901 (see below). 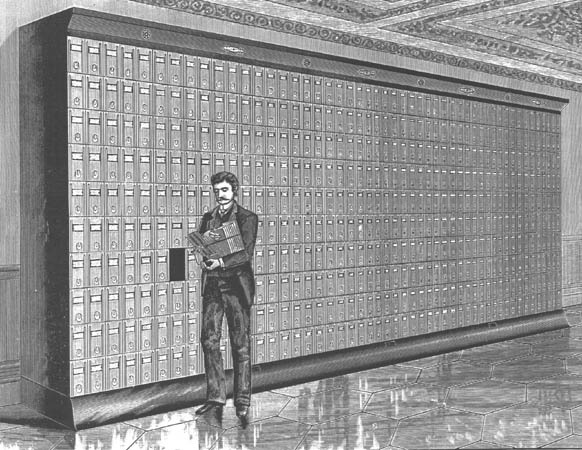 A large number of companies were advertising vertical files in 1903. Yates reports that, according to a report by a government commission, by 1911 "vertical flat filing [had] practically supplanted all other systems" in the large companies it investigated. See also Flanzraich. 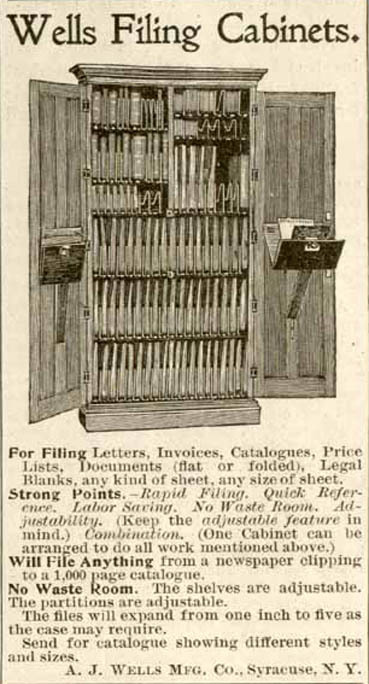 Steel vertical files were advertised by Art Metal Construction Co., Jamestown, NY, in 1903. Yawman & Erbe Mfg. Co., Rochester, NY. At the end of each year, offices often moved filed papers to "transfer filing cabinets" in storage areas to make room in the primary filing cabinets for papers to be filed during the coming year. 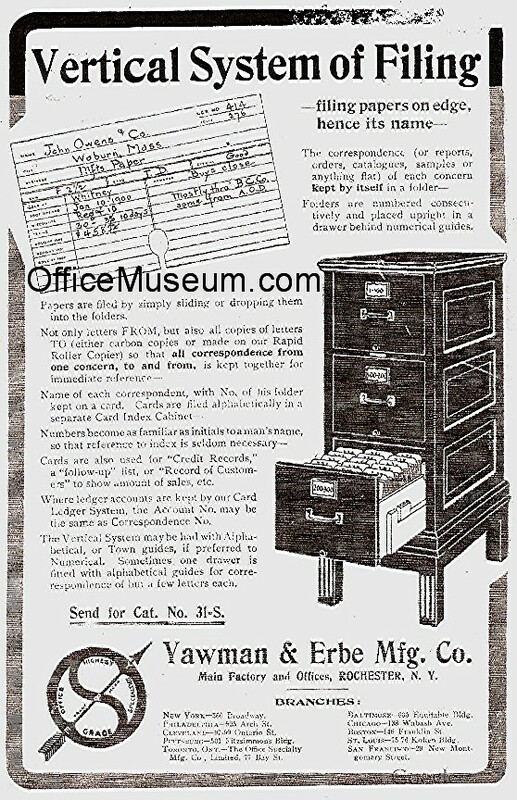 Transfer filing cabinets were more cheaply made than the primary filing cabinets, as the advertisement to the right illustrates. Vertical transfer file . .
Sectional Filing Cabinets were assembled by the customer from modules sold by the manufacturer. They could be rearranged and expanded as the customer's needs changed. Elastic Filing System, Globe-Wernicke Co., Cincinnati, OH, 1907 ad. 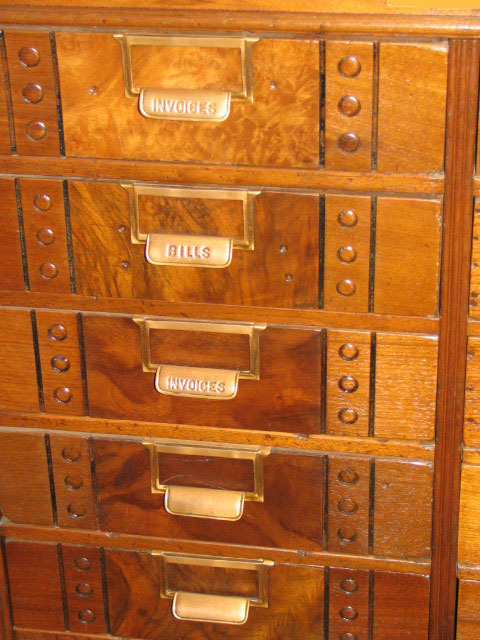 Document file sections like that at the top of this cabinet were advertised along with other modules of sectional files at least as late as 1928. Automatic File & Index Co., Green Bay, WI, Catalog 16. This company was founded in 1905. 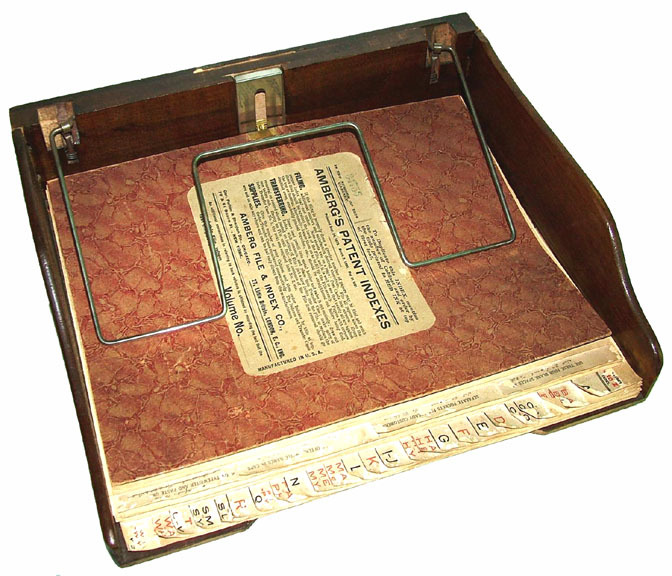 "Two cases similar to the one shown in the above illustration are used in the commercial and shorthand departments at the Albany Business College for teaching vertical letter filing and card indexing," Annual Catalogue, Albany Business College, Albany, NY, 1912. 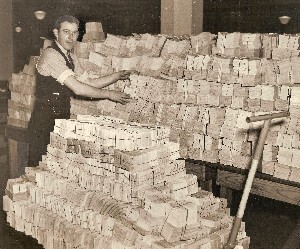 Allsteel File, General Fireproofing Co., Youngstown, OH, 1914. A. J. Wells Mfg. Co., Syracuse, NY, 1896 ad . 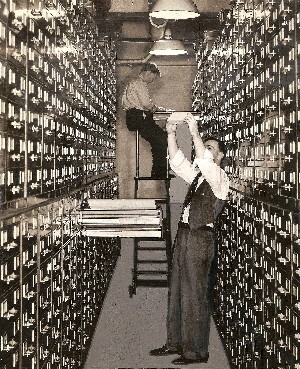 . .
Records on Tabulator Punch Cards Being Filed, 1939. Files occupied thousands of cubic feet. 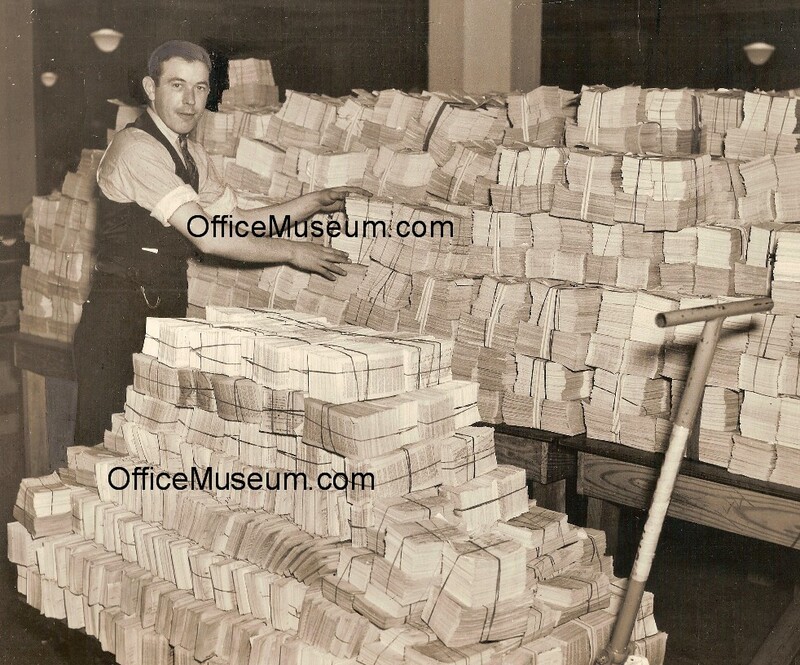 Chaffee, 1938, p. 4, states: "The vertical filing of papers was first tried by a Dr. [Nathaniel S.] Rosenau, secretary of the Associated Charities of Boston, after long experience in card filing. The following year, several firms tried it, and the Library Bureau..received a gold medal at the World's Fair at Chicago in 1893 for its vertical correspondence file." Chaffee provides no source to support these statements.